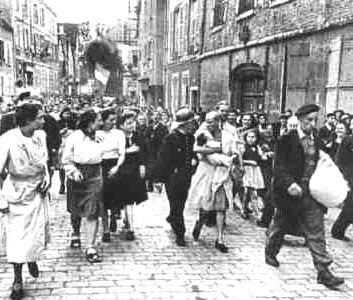 After the liberation of France from the Germans, there was a period when groups of people in France took the law into their own hands and settled scores against those who were accused of collaboration. In some cases people were arbitrarily condemned and then lined up against the wall and shot. 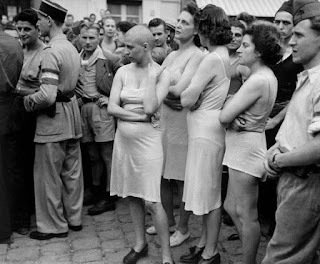 Among the victims of these reprisals were women who had fraternised with the Germans. Some of these, we are told, were prostitutes who had worked in military brothels -as if this would excuse this public cruelty!- many were just ordinary girls who had fallen for the charms of young men of another nationality. The punishment for these women is described by Brassens. In this song Brassens expresses his shock at the cruelty of which groups of people are capable in the grip of a strong. self-righteous, idea. À un tondeur de chiens. 1964 – from the album: Les copains d'abord. Her marked preference for repeats of "ich liebe dich "
Mops of hair not her own. To a man who sheared dogs. Have sided for her mane ,. To save her tight curls. They put the wind up me.. It's a girl’s kiss curl. (1) Le roi de Prusse. Brassens just means a German soldier, not necessarily a man of rank. A number of explanations have been given for this device. My own feeling is that it conveys the romantic view of the French girl in love of her German lover. (2) "ich liebe dich ". This phrase, of course, says « Je’t’aime in German. (3) Les braves sans-culottes, et les bonnets phrygiens. In this line Brassens identifies the masses of ordinary people who joined in the violent reprisals against alleged collaborators with the “sans-culottes” of the Revolution of 1789. They were then given this name because they didn't wear upper class breeches or “culottes”. The Phrygian bonnet was a symbol adopted by the 18th Century Revolution because it was worn at the time of the Roman Empire by former slaves who had been freed. Brassens aroused the anger of left wing activists by his depiction of them in this song. 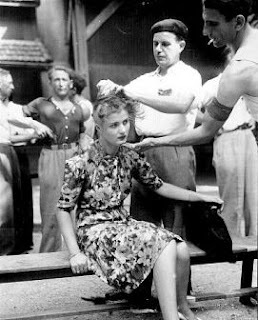 (4) Les coupeurs de cheveux en quatre. « En quatre » is used in a number of expressions to mean to the highest degree (for example “se mettre en quatre pour quelq’un” = to do your utmost for some-one. If Brassens was indeed threatened in 1945, he would not have been the first choice for bullies to pick on. For a time, Brassens was employed as a bodyguard for Jean-Paul Sartre. (5) Soft kiss curls. I put in the adjective to give me a 3 syllable translation. (6) Toupet has 2 meanings (a) tuft of hair (b) impudence. His gesture with the locket of hair was recognised by these administrators of rough justice as an act of defiance. (7) A Rosette is an insignia of honour in the military and in the Légion d’honneur. The job completed, the girl is led through the streets with her Franco-German baby. ..... the evils of mankind are caused, not by the primary aggressiveness of individuals, but by their self-transcending identification with groups whose common denominator is low intelligence and high emotionality. Nice explanation ! Pretty acurate. - Couper les cheveux en quatre, means over complitated the things. You can translate it litteraly : cut the hair by four. Not easy isn't it ? - Accroche cœur is the nickname for a solitary curly hair, like some women in the 20's have on their front head. Thank´s to share George Brassens with the world.